Proprietary Name: Galaxyborn Satin Cushion No 23 What is the Proprietary Name? Non-Proprietary Name: Titanium Dioxide, Octinoxate, Octisalate What is the Non-Proprietary Name? 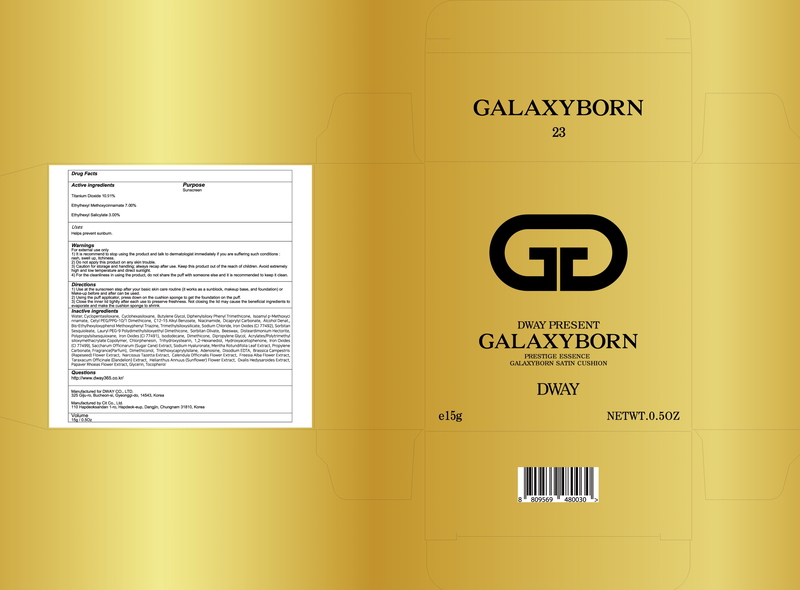 Galaxyborn Satin Cushion No 23 with NDC 72256-020 is a a human over the counter drug product labeled by Dway Co Ltd. The generic name of Galaxyborn Satin Cushion No 23 is titanium dioxide, octinoxate, octisalate. The product's dosage form is powder and is administered via topical form. Dosage Form: Powder - An intimate mixture of dry, finely divided drugs and/or chemicals that may be intended for internal or external use. Warnings:For external use only1) It is recommend to stop using the product and talk to dermatologist immediately if you are suffering such conditions : rash, swell up, itchiness.2) Do not apply this product on any skin trouble.3) Caution for storage and handling; always recap after use. Keep this product out of the reach of children. Avoid extremely high and low temperature and direct sunlight.4) For the cleanliness in using the product, do not share the puff with someone else and it is recommended to keep it clean. Uses:Helps prevent sunburn.Directions:1) Use at the sunscreen step after your basic skin care routine (it works as a sunblock, makeup base, and foundation) or Make-up before and after can be used.2) Using the puff applicator, press down on the cushion sponge to get the foundation on the puff.3) Close the inner lid tightly after each use to preserve freshness. Not closing the lid may cause the beneficial ingredients to evaporate and make the cushion sponge to shrink.